Dining Room window update. Fabric by Kasmir, pattern LeClaire Moonstone. Drapery panels are inverted pleat with scarf swag overlay. Helser Brothers Wrought Iron Tear Drop Pendant is finished to match hardware and attached to pointed end of swag. 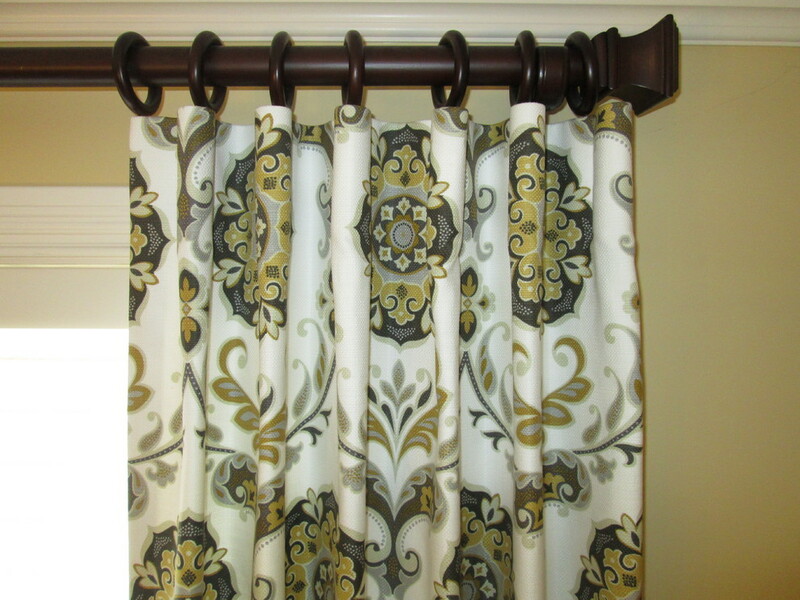 Panels are cream faux silk and hardware is by Paris Texas Hardware Company. Large family room with angled wall. Drapery panels are bright and colorful pulling in the colors from the surrounding rooms. Formal dining room with soft wall color. Drapery fabric accents and softens the tall ceilings and angles. Elegant Dining Room with double swags with silk and linen fabrics. Bishop Sleeve drapery panel on box bay corner and puddled panels. Inverted Pleat drapery panels, tied back, with boxed swag. Drapery panels, gathered with tiebacks in bay window. Inverted pleat drapery cascades. Decorative trim along top. Relaxed roman shade in contrast fabric. Decorative drapery panels, 15 feet tall, with drapery swag and brush trim. Combination Living/Family Room. Drapery panels finish the room without over doing the windows. Fabric is subtle and compliments the room. Symmetrical arched swags hung from medallions. Elegance is achieved with the swooping swags and puddling panels. In addition, bishop panels frame the corners of the boxed bay windows. Double swags with silk and linen fabrics. Bishop Sleeve drapery panel on box bay corner. Sheer drapery panels offer diffused light for master bedroom. Custom made pewter finished hardware completes the updated look and frames the view.. Tall windows with black drapery panels with swags. Living/Family Room. Client wanted comfortable look but not too casual. Fabric is faux silk with small pattern. Bold colored fabric accents inverted drapery panels with knotted rope trip at pleat. Morrison valance with contrast lined cascades. Toile roman shades for light control and privacy. Inverted pleat drapery panels hung from black wrought iron drapery rods. Ball tassel trim on leading edge of drapery. Padded wood cornice with silk drapery panels. Sheer shade is hand tacked for ruffled effect. Sheer drapery panels offer filtered light control. Stationary drapery panels flank window on short decorative drapery rods. Ripple fold sheer drapery panels mounted on ceiling track. 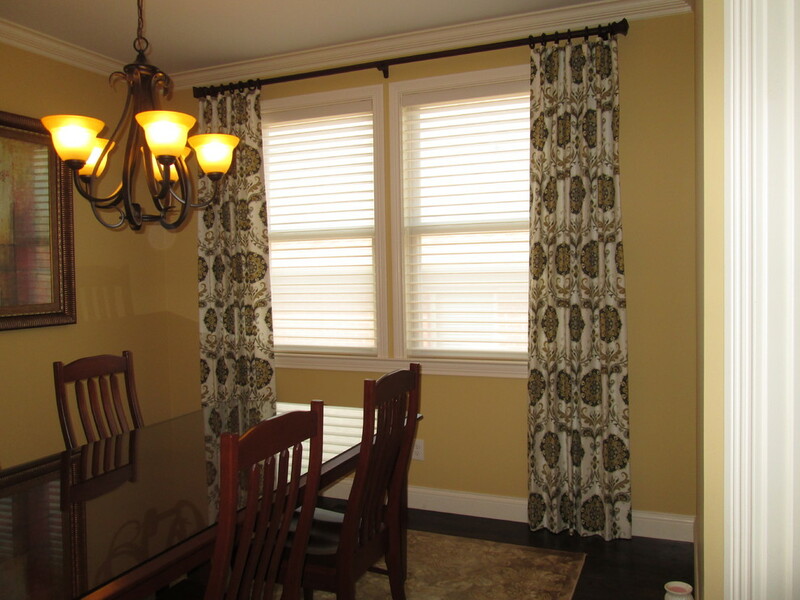 Bishop sleeve drapery panels enhance the dining room window without over doing the design. Customer was interested in added elegance and softness without covering woodwork and natural lighting. Euro pleat drapery panels in bold zig-zag fabric. Outdoor drapery panels for maximum light control.